Suppressing fire is used to overwhelm the enemy and win the firefight, with the aim being to restrict his ability to move. By keeping your opponent "pinned down", your team can safely maneuver to an ideal position to eliminate him. 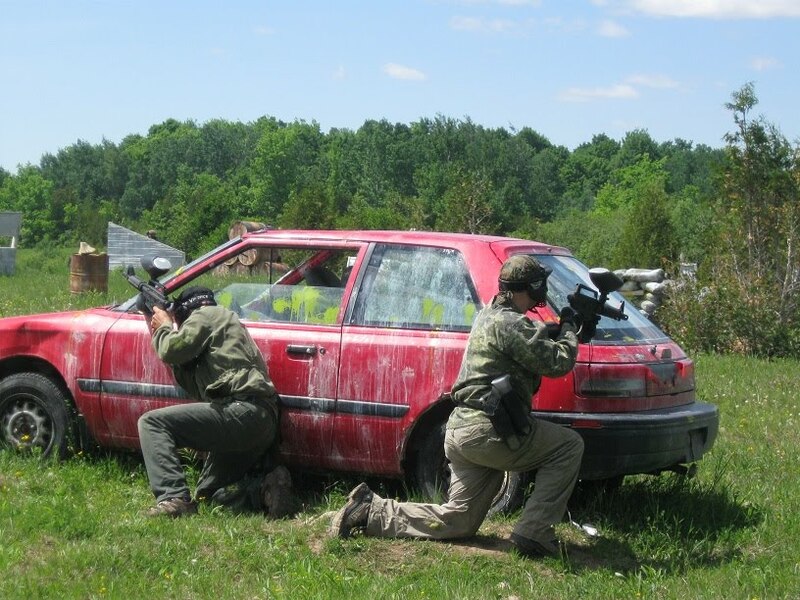 At first a lot of paintballs may need to be fired to win the firefight. It may take sustained fire from you and several of your squadmates to get your opponent to duck down and cower behind his bunker, but keep at it. Eventually the sheer firepower you're throwing at him will either hit him square in the mask, or force him to hunker down. Once you've won the firefight, and your opponent is suppressed, usually a single paintball fired every 3 to 5 seconds or so from you and your teammates will be enough to keep his head down. Although this may not seem like much, with 5 of you firing at different times every 3 to 5 seconds, an average of 1 or 2 paintballs every second will be flying over his head, convincing him it's still a good idea to stay behind cover. At this rate, even someone with a 20-round, mag-fed marker can suppress an opponent for a full minute, which is plenty of time for a team to make moves that will win the game! Just a note: With an opponent suppressed, a really dumb move is to shoot his cover/bunker. You see this a lot in woodsball games, and usually it's a rental or noob making this mistake. Shooting your opponent's cover will only suppress him if he's a noob, as an experienced player will realize that if all your incoming paintballs are breaking on the surface of his bunker, it's probably safe to pop out into the open and take shots back at you. This can lead to him snapshooting at you and taking back the initiative, which can further lead to him turning the tables and winning the firefight. As this series progresses, suppression and other tactics covered will be put together to demonstrate proper methods of attack and defence. But for now, all you need to understand about suppression is that you need to throw enough fire at an opponent to pin him down and get him to take cover, and once that's done keep up the fire at regular intervals to prevent him from popping out again and becoming a threat. You need to understand as well that suppression doesn't require an expensive 30 balls per second thrown at your opponent, and that a shot every few seconds from each team member will be sufficient volume of fire to accomplish the goal of keeping his head down.